The Latest in Literacy and IEPs, and So.Much.More. TOP NEWS: April 9 Is OSEP's Next Live Virtual Event on the Importance of IEPs! The first installment of OSEP's 2018 Virtual Symposia Series will comprise presentations, from a national perspective, on key topics related to individualized education programs (IEPs), and the need for high expectations and appropriate supports for students with disabilities. The symposium presentations will frame the importance of this issue for all of OSEP's stakeholders. In addition to the live event, related resources will be posted online for participants. To register, please visit the symposium information page. More information will be added to this page as it becomes available. You can also contact the symposium planning team with any questions you may have at osep-meeting@air.org. This month's newsletter is bursting at the seams with interesting and relevant information from OSEP and our partners in the field—wow, keep up the good work everyone! Our "Resources for You" section is focused on literacy and includes information about the exciting new Kid Zone! from the National Center on Improving Literacy. We've also included some new sections in our OSEP Update this month: the latest "Research News" and a "Dose of Data." Speaking of data, I recently had the opportunity to join several of my OSEP colleagues at one of the IDEA Data Center's (IDC) Interactive Institutes on Building a Culture of High-Quality Part B Data. I attended the institute that was held in Austin, Texas. Last month, another institute was held in Orlando, Florida. 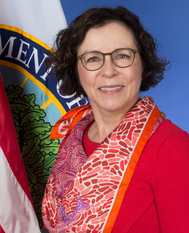 These institutes were designed to connect state teams who are responsible for Individuals with Disabilities Education Act (IDEA) Part B data with technical assistance (TA) providers, colleagues from other states, and federal staff. The state teams took full advantage of the institutes, often working late into the night on certain issues! Throughout the institutes, participants discussed State Systemic Improvement Plan (SSIP) evaluation, documenting data processes, and data visualization. What a great event! Last month, the U.S. Department of Education (ED) published in the Federal Register an NPRM concerning ED’s significant disproportionality regulation that was published on Dec. 19, 2016. As described in the NPRM, the Department is proposing to postpone the compliance date for implementing the significant disproportionality regulations by two years, from July 1, 2018, to July 1, 2020. The Department is also proposing to postpone the date that children ages 3 through 5 must be included in the analysis of significant disproportionality, from July 1, 2020, to July 1, 2022. The NPRM will be open for comment through May 14, 2018. The notice contains specific instructions for submitting comments. OSEP is wrapping up its SPP/APR reviews and preparing for clarification, which will occur in April. Please stay tuned for finalized clarification dates. On March 8, OSEP held its monthly National TA Call for states. The call focused on OSEP's latest investments in early childhood, the Early Childhood Systems Technical Assistance Center (ECTA), the Early Childhood Personnel Center (ECPC), and the National Center for Pyramid Model Innovations (NCPMI). The centers shared the outcomes they will be working towards and some of the activities they have planned for the next five years. They also discussed how they will be working collaboratively across all OSEP-funded early childhood investments to develop products and deliver TA services to most effectively meet the needs of states. Read more about these TA center work scopes in our early childhood section below. The focus of OSEP's March call with TA providers was to share useful information on providing the best support to states surrounding the implementation of their SSIPs and other pieces of the DMS process. We appreciated the information, tools, and best practices presented during this call by the State Implementation and Scaling-up of Evidence-based Practices Center (SISEP). You can find out more about this OSEP-funded center's work, and the resources they develop, by visiting their website. This month, we are highlighting a recent report from the National Center for Special Education in Charter Schools (NCSECS). It analyzes data from the annual Civil Rights Data Collection (CRDC) on students with disabilities in charter schools compared to those in public schools. In 2015, NCSECS published a report that analyzed data from the 2011–12 CRDC. The 2015 report examined key public school data and made state-by-state comparisons of critical indicators impacting the status of students with disabilities in charter schools compared to traditional public schools. The new report, Key Trends in Special Education in Charter Schools: A Secondary Analysis of the Civil Rights Data Collection, builds on the previous one by providing updates on the same key indicators. It also introduces additional information on enrollment, by disability type and charter school legal status, using the 2013–14 CRDC, the most recent data published by ED's Office for Civil Rights. You can view an executive summary of the report here, which outlines key questions, findings, and recommendations from the report. OSEP funds a network of centers tasked with providing resources and TA around the implementation of IDEA. Six of the centers work with state agencies responsible for implementing IDEA's early childhood provisions, IDEA Part C and Part B Section 619. These centers have recently collaborated to develop an easy-to-use infographic outlining their services. As you will see from the infographic, each center focuses on distinct content areas within its work scope. The centers also collaborate closely to ensure states receive the TA and resources necessary to meet their specific needs. The National Academies of Sciences, Engineering, and Medicine's Board on Children, Youth, and Families (BCYF) recently studied how to finance early care and education for children from birth to kindergarten-entry. Specifically, care and education that are accessible and affordable to families, of high quality, and inclusive of a well-qualified and adequately supported workforce, consistent with the vision outlined in this 2015 joint report from the Institute of Medicine and the National Research Council. BCYF's findings on financing are detailed in a new report, Transforming the Financing of Early Care and Education. It concludes that transforming the financing structure for early care and education to meet the needs of all children and families will require greater coordination among financing mechanisms, as well as significant mobilization of funding and other resources across the public and private sectors. The report offers specific recommendations for 1) making early childhood education and care more affordable for families, 2) linking funding to high-quality standards, and 3) financing the transformation of the early education and care workforce. 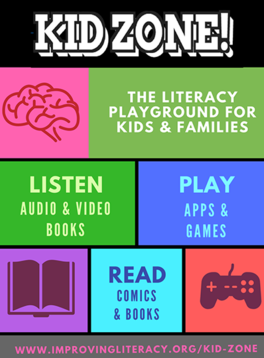 The National Center on Improving Literacy (NCIL) has launched an exciting new online portal, Kid Zone! Through Kid Zone!, kids and families can listen to audio and video books, play literacy apps and games, and read books at their level. The site also features the Kid Zone! exclusive comic book: Adventures in Reading, featuring Kayla, a student with dyslexia. The Kid Zone! was created with kids in mind, but it also is a place where families can connect with one another. Parents and caregivers play an important role in promoting and supporting children’s literacy development. You can do this by listening, looking, helping, and encouraging while your child explores Kid Zone! We invite you to check out Partner Reading: An Evidence-Based Practice – Teacher's Guide from the OSEP-funded Promoting Adolescents' Comprehension of Text (PACT) Plus project. PACT Plus is an initiative of the University of Texas at Austin's Meadows Center for Preventing Educational Risk. This teacher's guide focuses on partner reading in content-area classrooms, and was developed as part of OSEP's model demonstrations on adolescent literacy. IES' What Works Clearinghouse (WWC) recently released a practice guide, Foundational Skills to Support Reading for Understanding in Kindergarten Through 3rd Grade. It is divided into four recommendations for improving students’ literacy skills in the early grades. WWC also published two accompanying resources, listed below, that can help parents and caregivers put the guide's recommendations into action outside of the classroom. Tips for Supporting Reading Skills at Home: a six-page set of tips for parents and caregivers to help them carry out the recommended strategies in the practice guide. Evidence on Tips for Supporting Reading Skills at Home: a summary describing the research evidence that supports the approaches included in the guide and tips. The "Did You Know?" series, presented by the IES-funded National Center on Assessment and Accountability for Special Education (NCAASE), has released new one-page summaries (DYKs) of timely research completed by NCAASE researchers. Below are the latest releases, and be sure to keep checking the website for future DYKs! This month, we had the opportunity to interview Bentley Ponder, the director of research and evaluation for Georgia’s Department of Early Care and Learning (DECAL). 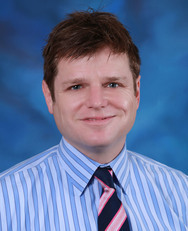 In the interview, available on the Office of Special Education and Rehabilitative Services (OSERS) Blog, Ponder shares his experiences connecting the evidence base with program and policy decisions, and how this can benefit any early childhood system.